Happy New Year 2008 to all Second Life Residents!! 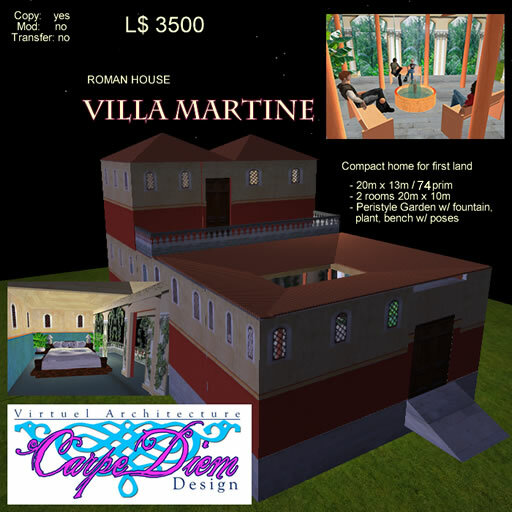 This year 2008 started well, friendships in real life and online abound, partnerships are growing and in Second Life I have produced a small version of a Roman Villa i had made last year. It’s ‘Villa Martine’. Why ‘Martine’? this is my real life name but also it is a Roman name which means poet, warrior, lover of music. This roman villa is suitable for a small plot on SL. Next Post Where has Mizou been all this time?